Treatment of an aldehyde with Grignard reagent followed by water (acid) forms usually a secondary alcohol with a new carbon-carbon bond. This reaction is an addition reaction because the elements of R (alkyl) and H are added across the π bond. 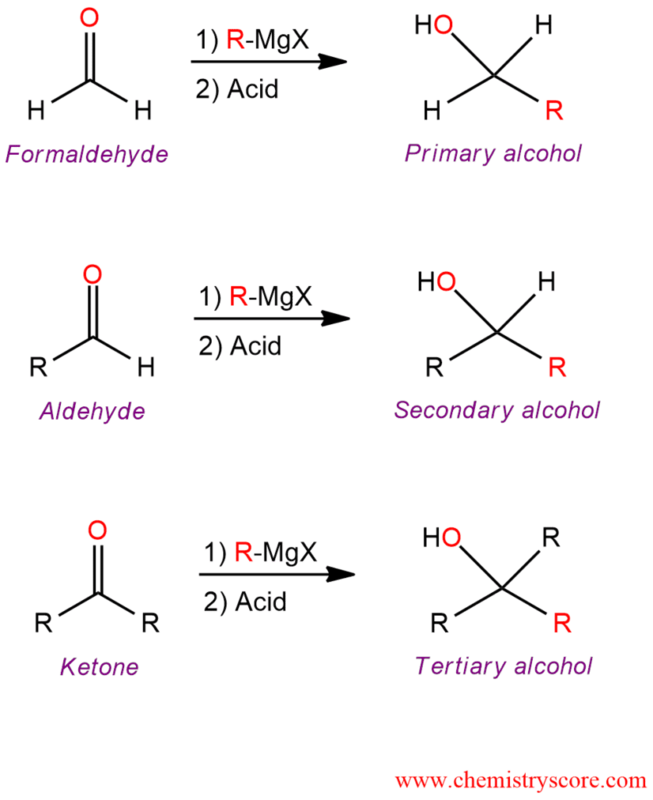 The reduction of aldehydes and ketones can achieve with a nucleophilic carbon. Attack by a carbon nucleophile on a carbonyl group would give an alcohol and simultaneously form the carbon-carbon bond. For these reactions, organometallic reagents are used in which a carbon atom of an organic group is bound to a metal (magnesium). These organomagnesium compounds, RMgX, are called Grignard reagents. They are strong bases and good nucleophiles and as such are extremely useful in organic syntheses. Their basicity makes them very sensitive in the presence of moisture so they rapidly react with water. Because the addition of the new alkyl group must be carried out under anhydrous conditions to prevent the reaction of water and Grignard reagent. Water is added after the addition to protonate the alkoxide. This reaction is used to prepare primary, secondary, and tertiary alcohols, depending on the number of alkyl groups bonded to the carbonyl carbon of the aldehyde or ketone. This mechanism consists of two steps. In the first step, the Grignard reagent function as a nucleophile and attacks the carbonyl group. The π bond cleaves and an alkoxide is formed. This step forms a new carbon-carbon bond. In the second step, the resulting alkoxide ion is then protonated by water to form the alcohol addition product. This acid-base reaction forms a new oxygen-carbon bond.